Ferrari has disclosed the first technical specifications of the new FF, the Italian automaker's very first foray into the all-wheel drive world. Ferrari describes it as the most powerful and versatile four-seater ever. Motivated by a V12 engine churning out 651 hp and 504 ft-lb of torque, the FF uses a Formula 1-inspired, dual-clutch transmission and can bound from 0-100 km/h in 3.7 seconds en route to top speeds of 335 km/h. Its four-wheel-drive system weighs half as much as a typical all-wheel drive system offered by other makes, ensuring ideal mass distribution. Thanks to predictive distribution of torque to the four wheels, a magnetorheological damping system and Brembo ceramic brakes, the FF can handle anything Mother Nature throws at it, on the road or on the track. According to Ferrari, the FF will boast a spacious cabin as well as between 450 and 800 litres of cargo capacity, depending on seat configuration. In addition, a huge selection of customization options will be available, including six exclusive body colours. 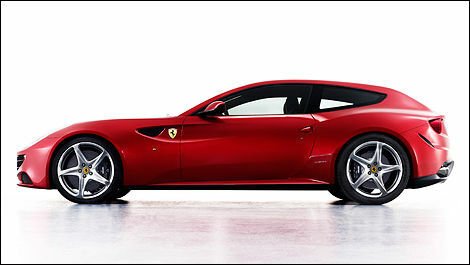 FF stands for Ferrari Four, referring to both the four seats and four-wheel drive. It will make its world debut at the Geneva Auto Show, held from March 3 to 13, 2011. Gift of the day: The New Ferrari FF playing in the snow!